Double matured in port casks, this malt is a toast to the Scottish traders who braved the high seas and were instrumental in founding the port wine trade, shipping it to the world. ‘Port Ruighe’ (pronounced ‘Portree’) is the Gaelic spelling of the once bustling trading port on Skye. 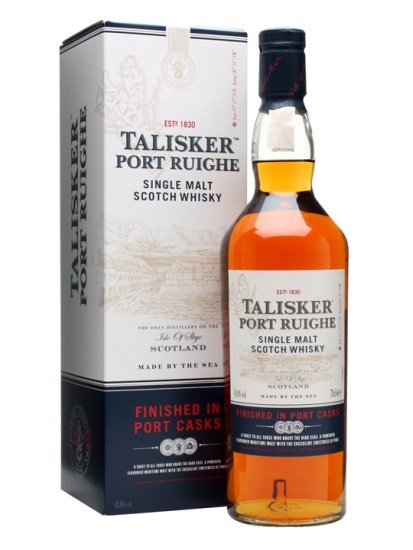 The Port finish combines TALISKER’S powerful maritime character with succulent sweet notes of rich berry fruits for a superb contrasting taste experience. Nose: Sweet smokiness of a dying wood burning fire with the richness of ripen plums. Palate: The initial pepper on the tongue soon develops into a peatiness with a difference. A creamy smokiness mingled with spice and dark fruits.